12/08/12 GRRLib 4.3.2 IS OUT !!! 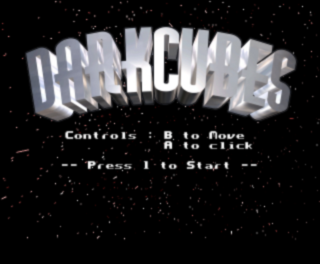 13/09/11 libogc 1.8.8 is out, GRRLib 4.3.1 is working perfectly with it. 21/06/11 libogc 1.8.7 is out, GRRLib 4.3.1 is working perfectly with it. 20/12/10 libogc 1.8.6 is out, GRRLib 4.3.1 is working perfectly with it. 26/10/10 libogc 1.8.5 is out, GRRLib 4.3.1 is working perfectly with it. 23/10/10 GRRLib 4.3.1 IS OUT !!! 28/06/10 GRRLib 4.3.0 IS OUT !!! 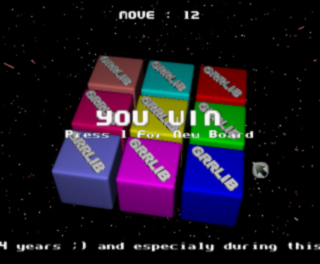 16/12/09 GRRLib 4.2.0 IS OUT !!! 24/11/09 GRRLib 4.1.1 IS OUT !!! 05/10/09 GRRLib 4.1.0 IS OUT !!! 23/07/09 BLUECHIP joined the GRRLib Development Team. 12/12/08 CRAYON joined the GRRLib Development Team. 24/06/08 Little Bug in the 3.0.0a New version 3.0.1a correct it. * Splitted functions for rotation/translation/scaling 3d object. - 3D_sample5 -> Simple demo of rotation/translation/scaling 3d object. 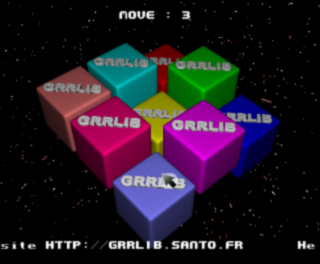 Like the new logo announced it, GRRLIB is now 3D too !!!!! In this release we also provide all sample .dol to permit everyone to test them without compiling them. Is GRRLib a good wii library ?